When I was growing up in Chicago in the 60’s and 70’s it seemed like there were only two Chevrolet dealerships in town. 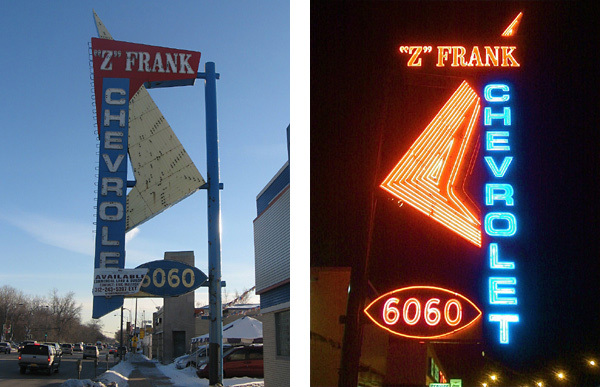 You either bought your Chevy at “Z” Frank or Nickey. My dad bought several Impala and Kingswoood wagons there before dropping the family wagon for a Monte Carlo. Zollie Frank founded ‘Z’ Frank in 1939 and originally sold Chryslers and Plymouths. He also founded the a leasing company Wheels Inc., becoming the first person to ever lease a car to a customer. Even though Zollie’s Chrysler/Plymouth dealership was highly successful, he saw a better opportunity with Chevrolet and so in the early 50’s he made the switch. Zollie was known for adorning customers with gifts of ice cream pies, cuff links or silver dollars as part of his savvy marketing techniques. Zollie died in 1990 but his sons continued to operate the dealership until it was acquired by Mike Anderson Chevrolet in late 2008. The huge neon sign that beaconed car buyers driving up Western Avenue will probably be gone soon, too big for a collector to have and not practical for the new property owner to keep. A sign of the times.